The hyperflex kit doesn't include the front bump stops. Add 1 of this kit to cover the front bump stops. The hyperflex kit doesn't include the rear bump stops. Add 1 of this kit to cover the rear bump stops. 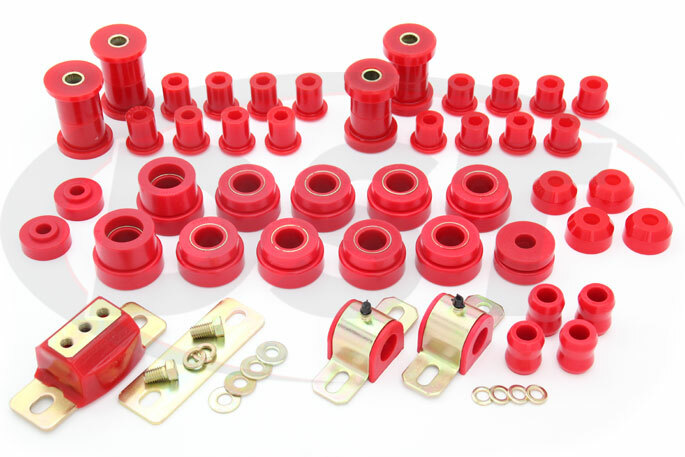 This Complete Bushing Replacement Kit from Energy Suspension will restore the suspension of your Jeep CJ7 by replacing the original rubber bushings with more durable polyurethane bushings. 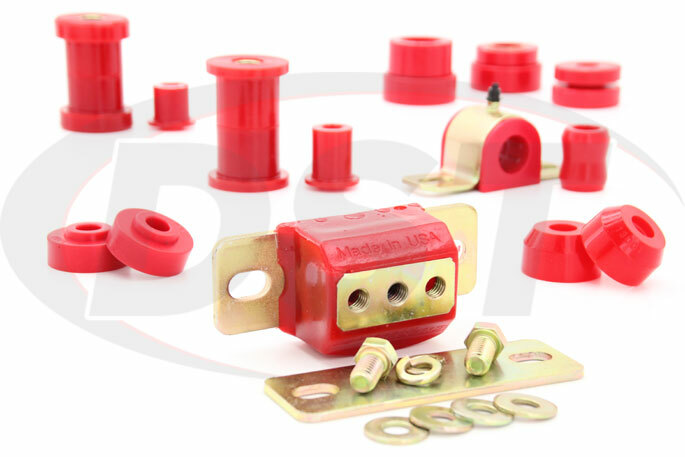 When you upgrade to Polyurethane suspension bushings you can expect many benefits such as consistently correct alignment, more even tire wear, and less body roll to name a few. 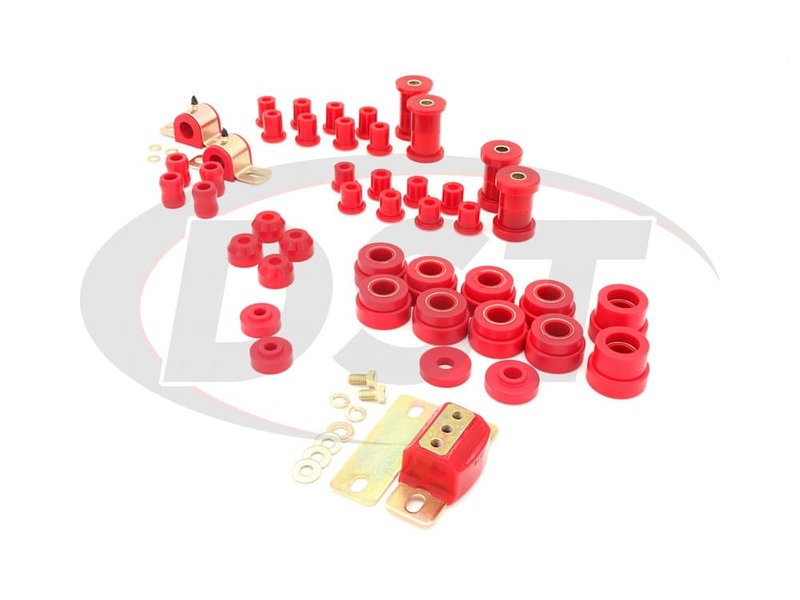 Whether you've owned your Jeep CJ7 for a while and want to upgrade the suspension, or you've just bought one as a project vehicle, the original rubber suspension bushings are something you're going to want to replace. Rubber is a great noise and vibration isolator but a bushing also has to hold your suspension components in alignment and the constant flexing and bending that rubber goes through can eventually change its shape and form a loose connection. If you love to wheel your Jeep around Erath county mud hole on the weekends or take the occasional trip to Big Bend, then those original bushings can wear down even faster. So if you need to replace them wouldn't it be nice to install a replacement that will last longer and hold alignment better? 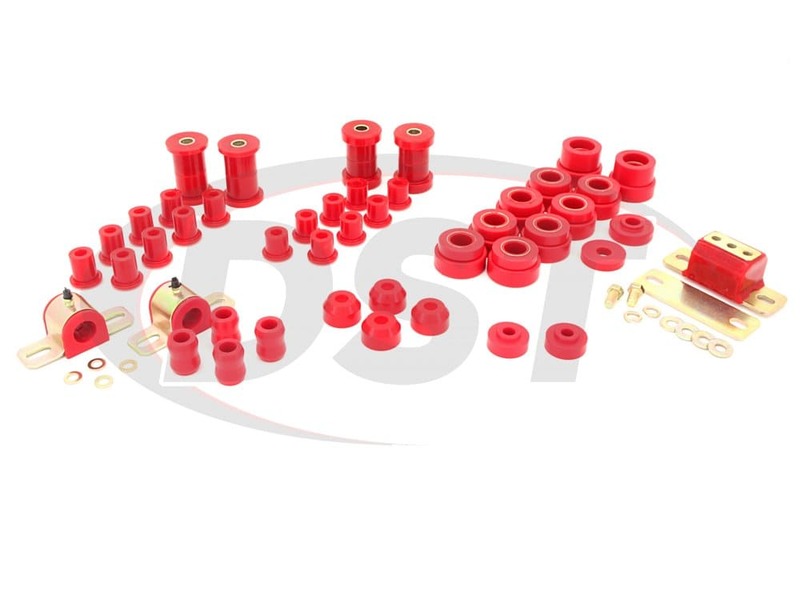 The Polyurethane Front Leaf Spring Bushings and Rear Leaf Spring Bushings in this kit provide a firm connection point at the ends of your leaf springs. Rubber bushings can hollow out as they wear down and allow the leaf spring to move and change the alignment of your rear axle. 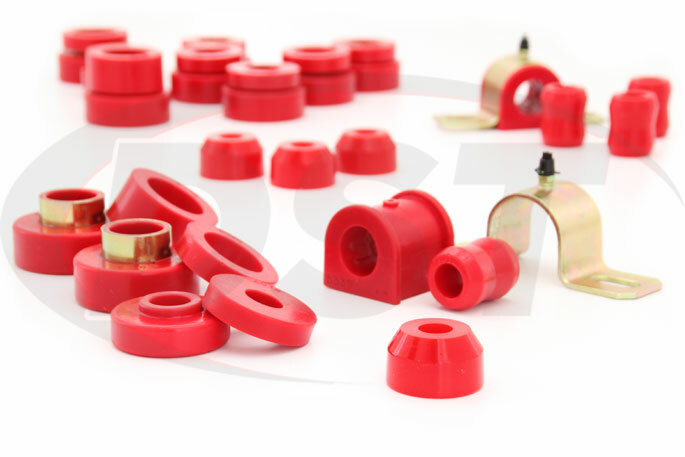 Polyurethane bushings do not flex like rubber and hold alignment in situations that rubber bushings would not be able to handle. Any looseness in the drive train will affect how fast you are able to accelerate and a rubber transmission mount will flex during takeoff, especially if you've dropped a bigger engine in your CJ7. Polyurethane Transmission Mounts won't absorb the power your engine is sending to the tires like rubber and will also last longer. 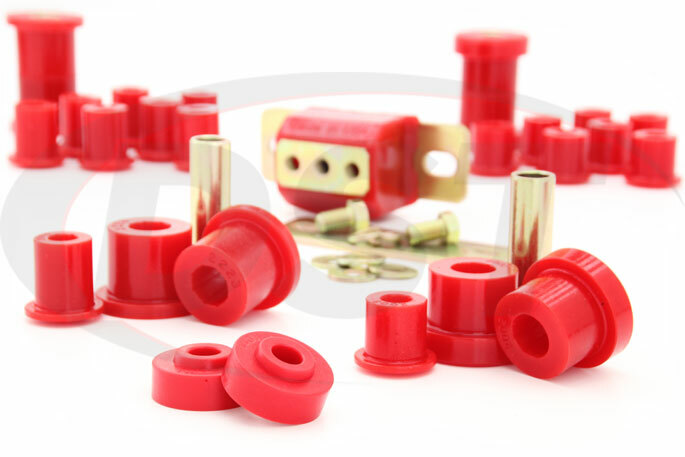 The Polyurethane Torque Arm Bushings also replace softer rubber bushings to provide more drive train stability when accelerating and braking. Polyurethane Sway Bar Bushings will hold the sway bar more firmly than rubber, reducing body roll and increasing traction during a turn. 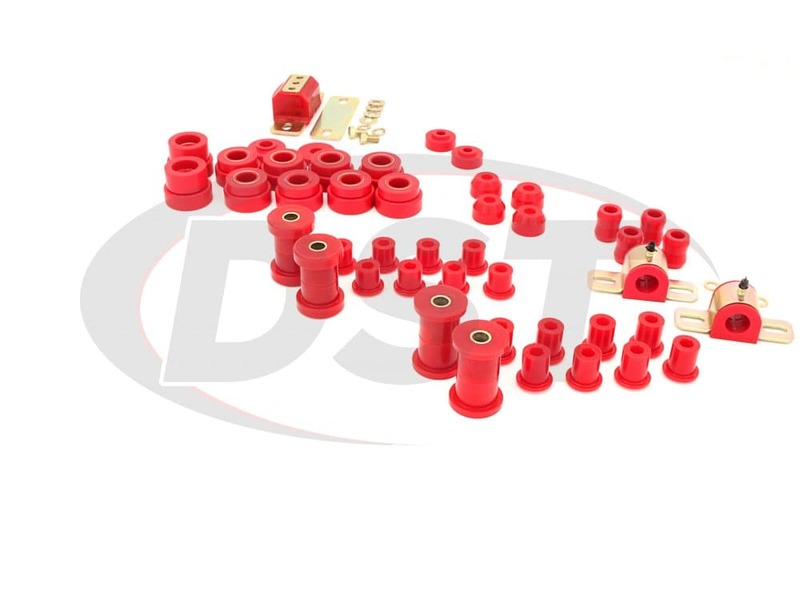 Since the sway bar doesn't connect directly to the frame the stiffer poly bushings will not transfer vibration to the cabin, so you get a longer lasting part that does its job better without losing any comfort. Polyurethane Body Mounts are much more durable than the original rubber mounts that sit between the body and the frame of your Jeep. As the rubber mounts degrade and wear away you will notice body sag on your Jeep and a rougher noisy ride, but polyurethane body mounts will hold their shape for the life of your Jeep, securing your body to frame connection. 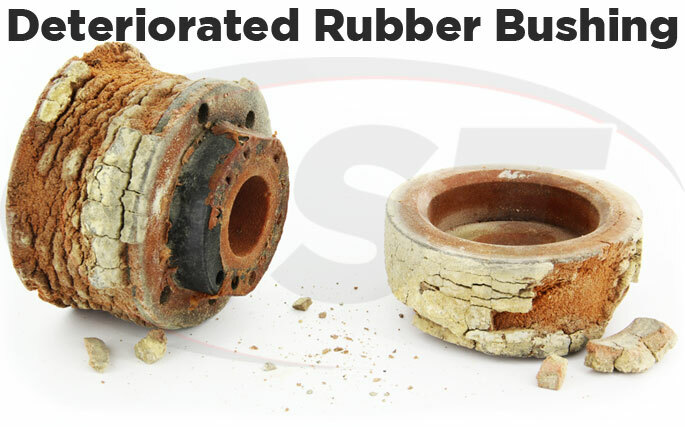 The rubber bushings on your Jeep help to absorb vibration and noise but they are the weakest link in your suspension. 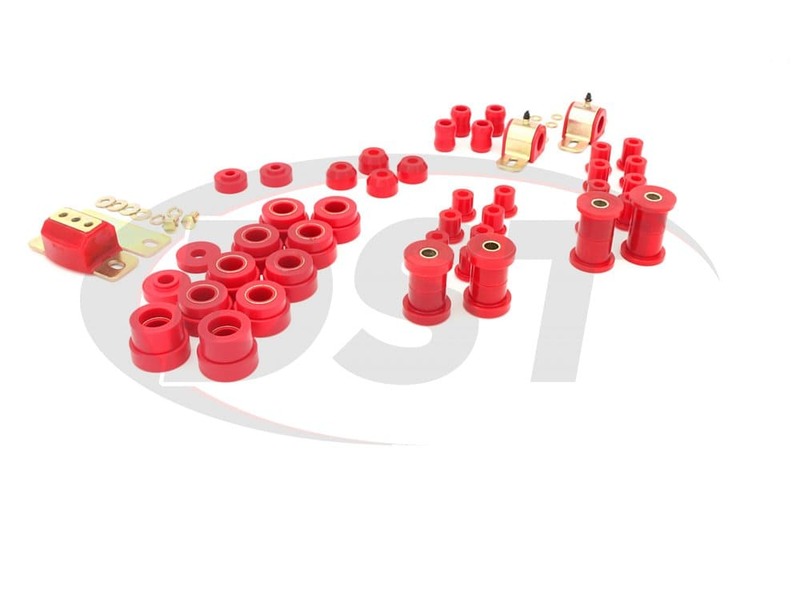 If you're more interested in performance and are willing to feel a little bit more of the trail then this polyurethane bushing kit will firm up your ride and provide a boost to throttle response, turning traction, and even out tire wear. These poly bushings are also backed by Suspension.com's exclusive lifetime warranty and we expect them to outlast your Jeep. If you take that as a challenge then we aren't surprised. The parts fit well but as expected were not a easy task to install. The gain in handling was noticeable but not as great as I would of liked. I gained about a quarter inch in body lift. Being that the old bushings were 32 yrs old the update was needed. I suggest that you have a air chisel available for the removal of the leaf spring eye bushings. The parts will definitely last longer than I will. 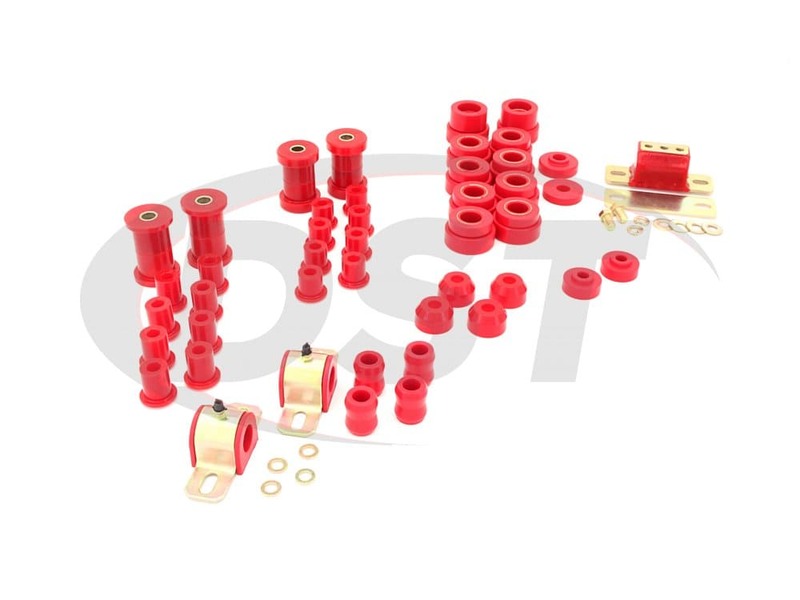 By replacing the original manufacturer bushings with this product, the suspension was tightened up, and the vehicle makes less noise on the drive. The product is worthwhile and easy to install. Will the 2.18102 kit include installation instructions? Would I be able to find them online? Can I get the 2.18102 kit with the 3 inch body mount lift? No, part number 2.18102 comes with the oem body mount only.